Director Ali Abbas Zafar shared a new still from the upcoming Christmas release ‘Tiger Zinda Hai’ and it looks like the film, featuring Salman Khan in the lead, which has some heavy-duty action sequences. ‘Tiger Zinda Hai’ is one of the most expensive films to be produced by the industry. The film produced by Yash Raj films will release in theatres on December 22nd 2017. No..doubt… Tiger Zinda Hai will be highest grosser of the year. Ha ha ha. Good joke. Highest grosser of the year is baahubali 2 even if we take only Hindi version. No chance for Chuha zinda hai ya mar Gaya. It is early to talk about B.O. Prospect but one thing is sure opening will be Historic! Life Time – depends how much good will be ali make it? dude! no bollywood movie has not crossed 30 cr in a normal day except dhoom3 who was a biggest franchise of bollwyood. so 30 + cr opening will be historic. don’t drag bahubali here. it was a dubbed movie not bollwyood! Wow This is gonna be EPIC. Ha ha ha. Dangal record in danger only in your dreams. Forget Dangal, forget even PK it will not even come close to dhoom 3’s record. Salman’s highest grosser among action films is still kick which is only 213 cr. So stay within 200 cr range don’t go too far. But salu bhai u should go jail lyk sanju baba .. So after that there will no one to dislike u ..
Is it a love-making scene with your sister….if not what’s the need the body double. Opening extended weekend ( 4 days ) will be atleast 150cr and then the content will come into place . If it clicks then RIP DANGAL . Curiosity is on another level now. He backed out bcoz another close friend of his was making the same movie.. Dont bash some1 unnecessarily.. It was shahrukh who shifted his movie date bcoz he knew the product called JHMS wasnt dat good for a clash.. Had he been in a clash it would have been an All time disaster. So if u dont like a particular person dont talk ill abt him.. Do something constructive in life and utilise ur tym!! No need to write articles bcoz no1 cares what u think coz everybdy have got a mind of their own. Ab Isko Kahte Hai “Last Action Hero”……. This Winter you will Fire in Theater…..
just one word to described that, “EPIC”!!!!!! The film is getting more interesting with each still! Golmaal Again, Padmavati, Tiger Zinda Hai, 2.0- Four super-exciting mega films in the next 4 months. Box office will be on fire for sure. These are body doubles’ arms. I am a regular gym person and ask anyone who works out. This person in the poster isn’t Salman. Salman fans will dislike this but truth won’t change. 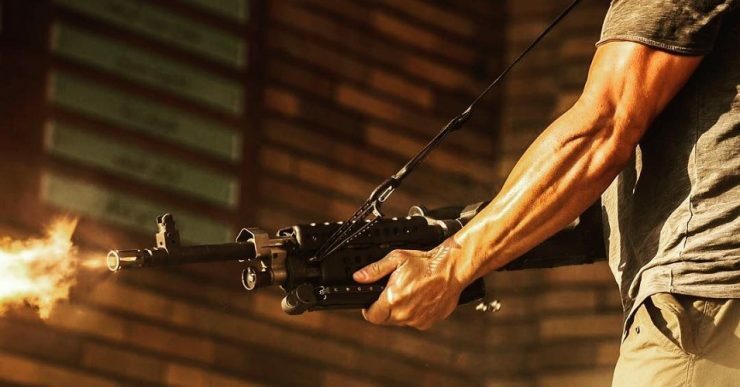 Get ready for lallu’s body double action and crap story.. even in this pic its some good physique guy holding gun and firing but they(yrf) portrayed him as salman,just wow..iam sure that in this movie, more than 50% of whole movie we will going to see salman’s body double. Jai ho(not salman wali jai ho)! !